To Sum It Up: Angels and demons never seemed real to Clary Fray, but a night at the Pandemonium Club proves otherwise. An entire world of vampires, warlocks, and werewolves has been painstakingly kept hidden from her until now. It’s time for Clary to finally embrace her true identity as a Shadowhunter, one of the angelic descendants dedicated to protecting humans from the evil they don’t even realize surrounds them. Clary’s first priority, though, is to find her missing mother whose sudden disappearance may be a sign that a past conflict among the Shadowhunters is about to reignite. Review: Rereading a book, especially one that I first read pre-blog, is always an adventure for me. I’m interested to see if my opinion has changed or if I feel the same way about the book in question. City of Bones had more than a little pressure on it to be as good as I remembered it. Although The Infernal Devices remains my favorite Shadowhunter series, City of Bones was my introduction to the Shadowhunter world, and I couldn’t help feeling a bit sentimental while turning its pages. I’m probably going to wind up referring to TID a few non-spoilery times throughout this review, just because I’m still unable to, on a somewhat subconscious level, let go of that series. So here’s reference #1. Before the release of Clockwork Princess, my nerdy self required a reread of Clockwork Angel and Clockwork Prince. Those two books blew me away all over again with their awesomeness. I didn’t expect quite the same reaction to a reread of City of Bones because I didn’t consider it a five star read the first time around. It was a solid four, maybe four and half then, and I still think so now. The world of angels and demons with some vampires, warlocks, werewolves, and faeries thrown in was just as exciting to discover all over again. I am also such a sucker for books set in New York City, and City of Bones scores extra points for referencing real places in my old Brooklyn neighborhood. I get a geeky thrill from the thought of the Shadowhunters walking the same streets I did for a good part of my life. In addition to the richly detailed world and its pretty epic scale, the novel’s other standout is Mr. Jace Wayland. I cannot explain why I go for the snarky boys; I just do. (It should come as no surprise that I love TID’s snarky Will Herondale, too; in fact, I love him more than Jace.) Jace is arrogant and a smartass, but he’s also the guy whom you want fighting on your side. Without a doubt. Something I noticed this read around was the pacing. 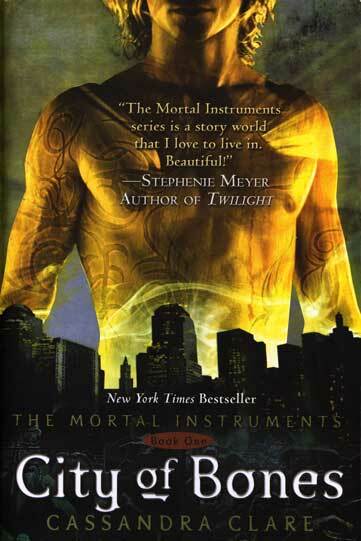 The disappearance of Clary’s mother, Jocelyn, is central to the plot, yet the book is in no rush for her to be found. Speaking of Clary, I’m sorry to say that I’m still not impressed with her as a heroine, at least at this point in the series. She does not particularly excel at putting two and two together; helloooo Clary: your best friend is in love with you and you have no clue! Clary is also impulsive in a way that tends to lead to trouble as opposed to making me see her as a badass. I don’t think any amount of rereads could keep me from going, “What the . . . ? !” at the ending of City of Bones. Despite that crazy twist not being a complete shock this time, my brain encountered some difficulty processing it. Again. There’s really not much you can say after an ending like that, and on that note, I do believe this review is done. All in All: The Shadowhunters continue to rule as the coolest demon fighters around, whether they’re saving Victorian England or modern day New York. City of Bones is where everything Shadowhunter-related started for me, and it’s a very good beginning, indeed. I can't imagine what it must be like to read a beloved book that is set where you grew up...ESPECIALLY growing up in a city as thrilling as NYC! Now, every single time I read your thoughts on TID, I am reminded that I seriously must read my copy of book one...SO, this is me adding it to my night stand so I WILL check it out soon. Moving on, I'm glad that your re-read was just as satisfying as the first time around was! Like you, my favorite parts of this were indeed Jace and the brilliant combination of all those supernatural beings co-existing within NYC! And yeah, that ending definitely is one huge shocker. Clary was definitely the weakest link for me and looking back I feel like my inability to warm up to her is probably my main complaint with this series. I'm really glad you decided to review these on the blog, I've always been curious to read your thoughts on these! Ally read CoB first, and I remember geeking out with her over Brooklyn getting a few shout-outs. I've always wondered if Clare spent some time in Greenpoint/Williamsburg because TMI references specific, real-life streets and other local places. That's the question I'd want to ask her if I ever met her. I totally agree with you on Clary being the weak link in the series. She was a little better in the most recent TMI book, but she's still got a long way to go to impress me, and we're down to the final installment, lol. I can't wait to read City of Heavenly Fire, though I'm probably not getting to it for a while. There's so much non-bookish stuff going on right now that my TMI reread has almost ground to a halt. :( But I will get there! I feel the same way! This was one of the first YA series that I read when I finally found my love of reading again as an adult. The Shadowhunter world just wowed me then, and it still does, though I've ended up absoutely falling in love with the TID characters. I'm extremely curious to check out the next two Shadowhunter series that are on the horizon!